(a) Conceptual drawing of nanoparticle-based superlens; (b) Actual superlens made from titanium dioxide nanoparticles; (c) Scanning electron microscope image of a 60nm-sized sample (d) Superlens image of the same 60nm-sized sample. Images: © Bangor University/Fudan University. As reported in a paper in Science Advances, a team of scientists from China and the UK has developed new solid 3D superlenses made from titanium dioxide nanoparticles that can reveal surface features not previously visible through a light microscope. Illustrating the strength of the new superlenses, the scientists describe seeing, for the first time, the actual information on the surface of a Blu-Ray DVD. Current light microscopes cannot see the grooves containing the data – but now this data can be revealed. 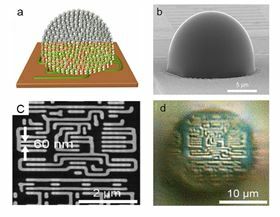 Led by Zengbo Wang at Bangor University in the UK and Limin Wu at Fudan University in China, the team created tiny droplet-like lens structures, which are deposited on the surface being examined. These lenses act as an additional lens to magnify surface features that were previously invisible to a normal lens. Made of millions of nanoparticles, the lenses break up the light beam: each bead refracts the light to produce tiny, individual torch-like beams. The very small size of each beam of light helps to illuminate the surface, extending the resolving ability of the microscope to record-breaking levels. These new superlenses can increase the magnification of existing microscopes by a factor of five. Extending the limit of the classical microscope's resolution has been the 'Holy Grail' of microscopy for over a century. Physical laws of light make it impossible to view objects smaller than 200nm, around the size of the smallest bacteria, using a normal microscope alone. However, superlenses offer a way around this limit, with various labs and teams researching different models and materials. "We've used high-index titanium dioxide (TiO2) nanoparticles as the building element of the lens," explains Wang. "These nanoparticles are able to bend light to a higher degree than water. To explain, when putting a spoon into a cup of this material, if it were possible, you'd see a larger bend where your spoon enters the material than you would looking at the same spoon in a glass of water. Each sphere bends the light to a high magnitude and splits the light beam, creating millions of individual beams of light. It is these tiny light beams which enable us to view previously unseen detail." Wang believes that the results will be easily replicable and that other labs will soon be adopting the technology and using it for themselves. Not only is titanium dioxide cheap and readily available, but applying the superlenses to the material being viewed is easier than modifying the microscope. "We have already viewed details to a far greater level than was previously possible," says Wang. "The next challenge is to adapt the technology for use in biology and medicine. This would not require the current use of a combination of dyes and stains and laser light, which change the samples being viewed. The new lens will be used to see germs and viruses not previously visible." This story is adapted from material from Bangor University, with editorial changes made by Materials Today. The views expressed in this article do not necessarily represent those of Elsevier. Link to original source. Engineers have used metamaterials and 3D printing to develop a novel lens able to focus electromagnetic radiation at terahertz frequencies.